German physician; born at Landsberg-on-the-Warthe May 10, 1865; son of Wilhelm Klemperer; studied at the universities of Breslau, Halle, and Berlin (M.D. 1885). From 1887 to 1896 he was assistant to Professor von Leyden; he was admitted, as privat-docent in 1889, to the medical faculty of the University of Berlin, where in 1895 he became professor. 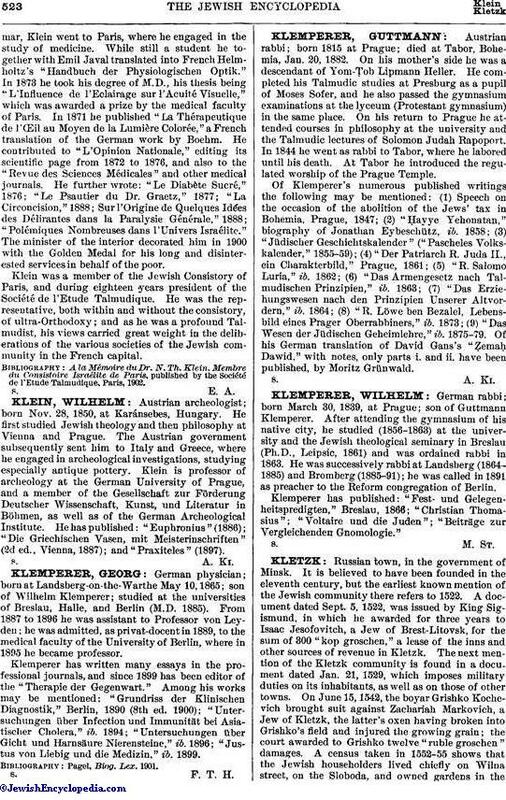 Klemperer has written many essays in the professional journals, and since 1899 has been editor of the "Therapie der Gegenwart." Among his works may be mentioned: "Grundriss der Klinischen Diagnostik," Berlin, 1890 (8th ed. 1900); "Untersuchungen über Infection und Immunität bei Asiatischer Cholera," ib. 1894; "Untersuchungen uuüber Gicht und Harnsäure Nierensteine," ib. 1896; "Justus von Liebig und die Medizin," ib. 1899.